I have always been an advocate for RV tire care and maintenance. Recently I received an e-mail from Roger Marble who is a retired tire design quality engineer with 39 plus years experience. 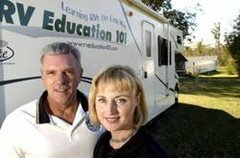 Roger now gives tire seminars at RV events. He e-mailed me these two pictures of an RV tire. In one picture the tire is inflated to 65.5 PSI and in the other the tire is inflated to 45.5 PSI. Roger challenged me to pick which tire was which. Of course I had a 50% chance of being right or wrong, but the point was you cannot determine the tire pressure by looking at the tires. There can be as much as 20 PSI difference between tires that look the same. I am sure you have heard the expression “where the rubber meets the road.” The tires are the most vulnerable component on your RV. 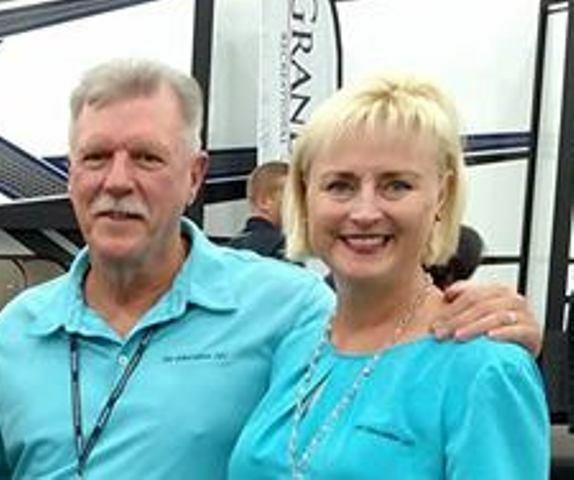 They are subject to abuse from road conditions, overloading, under-inflation, over-inflation and often time’s plain old neglect from the RV owner. We all tend to take tires for granted. You know what I mean, when was the last time you checked the inflation pressure in your tires? Especially the inner duals if you have a motor home. Better yet, when was the last time you had your RV weighed? Two of the biggest problems are overloading and under-inflation. Overweight RVs and under inflated tires are both unsafe, send operating and repair costs sky high and can cause unexpected downtime. Failure to maintain the correct tire pressure can result in fast tread wear, uneven wear, poor handling, and excessive heat, which can lead to early tire failure. 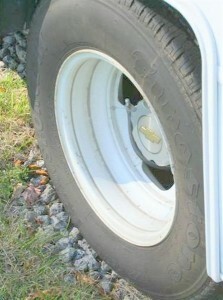 When a tire fails many RVers contribute it to a defect in the tire, but that is rarely the case. 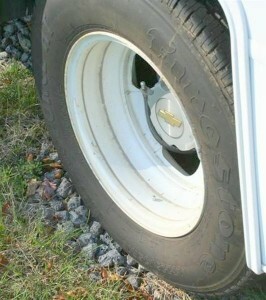 Overloading the tires on your RV is probably the number one leading cause of tire failure. Poor weight distribution and taking advantage of all of the storage space offered on today’s RV’s result in tire overloads. The only way to find out is to have the fully loaded vehicle weighed on platform scales. Load the vehicle with everything you plan to take on a trip including passengers, cargo, fuel, full fresh water and propane tanks. If you tow something behind the RV take it to the scales with you. The problem is that it is quite possible to weigh the RV and not exceed the GVWR, GAWR or GCWR, but you could be exceeding the individual tire ratings. This is why you MUST weigh each axle end separately to determine if tire ratings are exceeded and if the loaded weight is properly distributed. Another leading cause of tire failure is under inflated tires. The load rating for a tire is only accurate if the tire is properly inflated for the load. An underinflated tire can’t carry the load of a properly inflated tire and the extra weight causes greater heat buildup in the tire, which can lead to tire failure. The appearance of the tire can look normal but the internal damage is not visible and the tire can fail at any time without warning. If you find any tire 20% or more below the correct inflation pressure have it removed, demounted and inspected. Driving on a tire that is 20% or more under inflated can cause serious, permanent damage to the tire that may not be visible to the eye. Tires can lose up to two pounds of air pressure per month. If you don’t check your tires for three or four months they could be seriously under inflated. Ideally you should check tire inflation, and adjust it if required, everyday that you move or drive your RV. If you can’t get into the habit of doing it on a daily basis you need to make it a point to check all tires weekly at a minimum when you’re traveling. You always want to check the tires when they are cold, meaning that you don’t drive or move the RV before checking inflation pressure. If you check the inflation pressure when the tires are hot you will get a higher pressure reading and if you let some air out they’ll be under inflated when they are cold. If you have dual wheels you’ll want to add extension hoses to the valve stems to make the job of checking tire inflation easier. It can be nearly impossible to check the inner dual without extension hoses. The best extension hoses will have stainless steel reinforcement and external braiding for long trouble-free life. Make sure the ends of the hoses are securely attached to the wheels. If you add extension hoses you should replace the rubber valve stems with all steel valve stems. The added weight of the extension hoses can cause rubber stems to leak air resulting in under inflation. The only way to correctly measure the inflation pressure in your tires is with a quality inflation pressure gauge. Using your boot or a Billie club is not a quality pressure gauge, and don’t ever depend on your eyes to check tire inflation. There can be as much as 20 PSI difference between tires that look the same. You need to invest in an accurate inflation pressure gauge. You should get one with a double, angled foot. This makes it much easier to check the outer tire of a dual set.